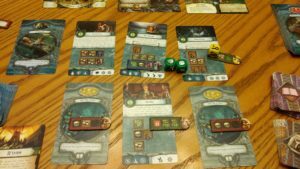 We just bought the Omens of the Deep expansion for Elder Sign, so I thought I’d try that for my Elder Sign solo play through. Omens of the Deep is another story-driven expansion with new adventure cards, new entrance, and the addition of missions (which are tossed in with the original monsters) and Deep Ones Legion monsters which are spawned separately from the regular monsters. In this expansion, the investigators are on a ship, trying to prevent the awakening of the ancient one. 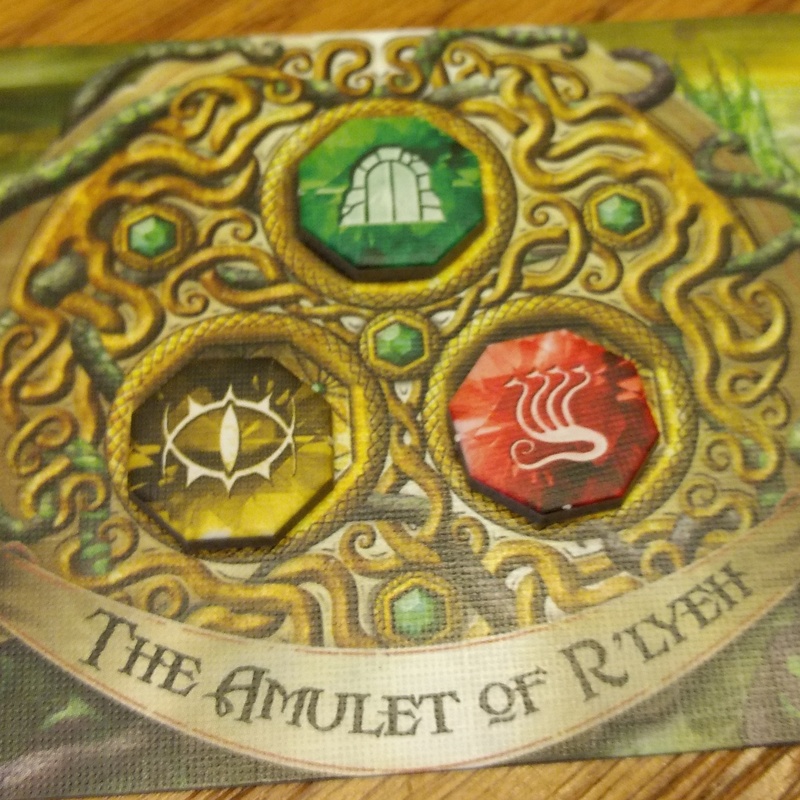 The expansion has some cool stickers to keep and collect and more importantly new adventure cards. 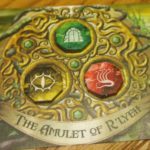 As with other recent expansions the game is played in two phases; in the first phase, the investigators are seeking out the pieces of a broken amulet and advancing an omen token. 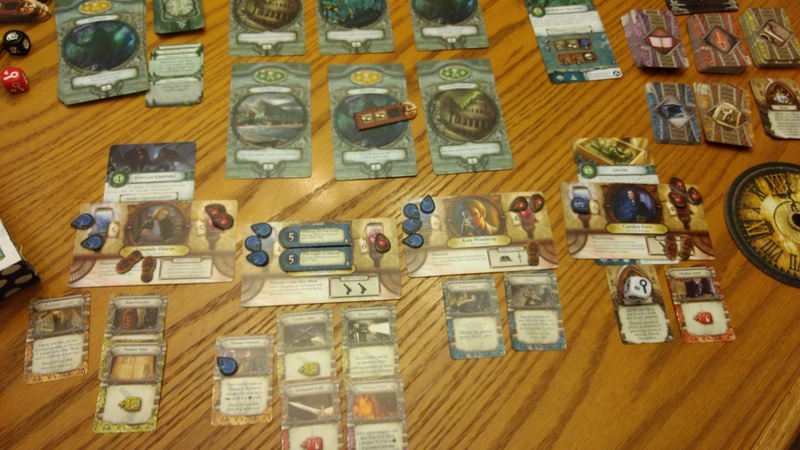 In the second phase, the investigators concentrate on getting elder signs and preventing the ancient one from awakening. In the solo game, it’s not clear if I should just play one investigator or more, so I played a couple of different ways – once with two investigators, once with three, and once with four. 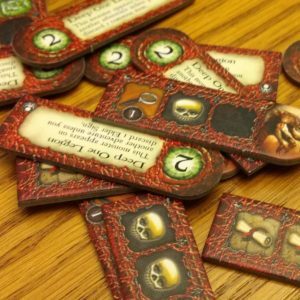 I played that if I lost an investigator, I added a doom token to the doom track and did not replace the investigator. This expansion is HARD. 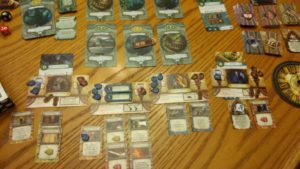 I played three times, losing each time with only a handful of elder signs. I think I needed to concentrate on moving to phase 2 faster, but it’s not easy when you are just trying to keep your investigators alive. It feels like there are a lot more “sanity” penalties in this one than “stamina”, making high sanity characters much more desirable. In the solo play-through, I miss the player interaction, and it feels like an awful lot of set up just for one person to play. However, I enjoyed it enough to play through three times, so I guess I couldn’t have been overly annoyed.